What brands of Xbox 1 wired controllers are compatible with my Titan2? 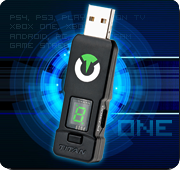 All Microsoft and third-party Xbox One controllers are supported bu the Titan Two. Is there a simple way to make your own scripts. I have found the forums are a great place to learn about scripting. There are many scripts and examples. If there is something specific you want to perform, see if a script does what you need and then modify it to have it perform differently. Coding is an art form to a degree but it can be learned, especially with so many helpful forum members willing to assist. Where’s the PRIMER for idiots who’ve never used one of these things before? I’ve managed to finally get the firmware updated, and I’ve installed the CODWW2 thing, but I cannot get my controllers to even connect to the PS4 if the TitanTWO is in the middle. And now that I reconnect the TitanTWO to the Mac, it REFUSES to even show up in GTunerIV! Even using the arcane plug in with buttons pressed, unplug, plug back in, method that previously worked. Based in your feedback mostly like this option is disabled. System Settings → Controllers and Sensors → Check the Option: Pro Controller Wired Communication. Thank you very much for the fast response I’m pretty sure I can but is it possible to use it with the wireless adapter from Microsoft? Yes, the Xbox Wireless Adapter can be used to play wirelessly on Switch with Xbox One controller. Thank you. Thank you so much for your help I really appreciate it and I’m sorry for bothering you But can I please ask if there is anyways to use the titan two with the elite controller on pc to play destiny2? 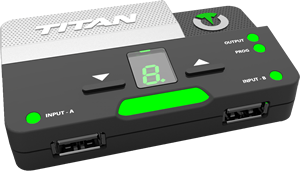 Yes, for that configure the Output protocol of the Titan two to “USB Xbox 360″. Thank you. 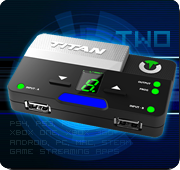 Anyone that is using the titan two for Fortnite on ps4…are you experiencing an issue if you have a gamepack downloaded and operating on your Titan Two not being able to press certain functioning buttons?? I.e. when im in the “loadout screen” it will not allow me to move guns/splodes/heals from spot to spot. i have to actually drop every item in my inventory and pick it up in the order in which i want it. Can someone help a brother out!? With the official Gamepack you should be able to rearrange the inventory normally. As what you are describing may require more information, please use our forums to request help on this matter. thank you. Anything been done on Xbox !X consoles as of yet ,Havent seen anything please tell Titan 2 Support is Working on this By now??.. The Xbox X console is supported by the Titan two.